I am so loving our new Decor Elements. We were given a sneak peak of a few of the new elements that will be part of the 2nd phase of the Decor Element product line. 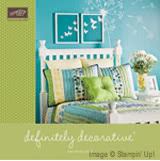 I'm thinking of redoing my daughter's room with the bright & beautiful flowers.